When the spring arrives the wind blows in Alexandria. It’s not any kind of wind, it’s a stubborn wind that sweeps the whole city, sneaking through the leaks in the buildings, tousling the ideas, rolling-up the skirts of women and the galabiyya of men. When the spring comes and the wind blows in Alexandria, the sky is filled with kites. Children and those who have been children go out to the streets carrying their hand-made kites. Cane structures with plastic skin and long laced tails that dance among the clouds. Sometimes they dance softly, sometimes they dance hard. Shaking their tails to the beat of the wind when spring comes to Alexandria. When spring comes and kites dance in Alexandria, it’s the beginning of the fishing season. Hook fishing in the tramway’s cables and the balconies and the barbwire of public buildings. 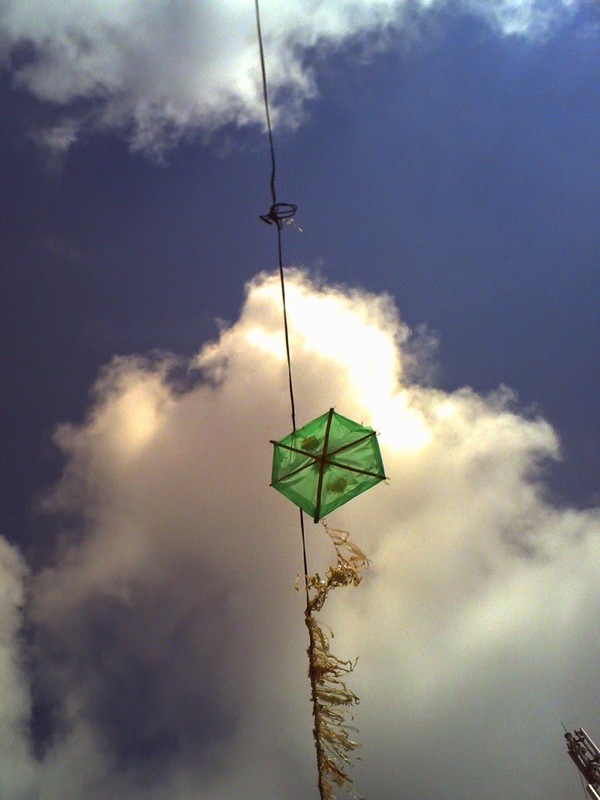 Because it happens that, sometimes, in the midst of the hectic dance between the plastic and the wind, kites stay suspended in the air, hooked in the pike. And then the summer comes and the wind slows down, the sun blasts the windows and heats the asphalt. Autumn and the rain and winter and the fog. And kites remain peeled in the void, almost flying, almost dying. I live in a fourteenth floor with windows as wide as walls. So wide the windows that on foggy days I live in a cloud. I sleep in a room in a fourteenth floor and sometimes vertigo sneaks into my dreams. When this happens I dream, for instance, that I fall from the window. I dream the descent through the fourteen floors between my clouds and the ground. One could expect a disturbing and sorrowful dream from such a fall. But sometimes, when you dream from a fourteenth floor with windows like walls, falling in dreams is pleasant and healing. Because while falling you discover a kite entangled in the TV wire. And you see two neighbors gossiping in the rooftop next door. And you can mingle among the tamed flight of a pigeons flock. To fall while dreaming in Alexandria happens to be pleasant because in the middle of the flight you realize that there’s something different. When reaching the twelfth floor you wonder why are you so calm and you find out that, against all odds, the air blows horizontally, holding you. That you don’t fall without control, on the contrary, you glide slowly like a kite. And you wake up before reaching the fifth floor and you’re happy because you’ve seen the world from the fall. From the blog Alexandria why? Five years ago the calendar was torn in Egypt and the world was shacked for a while. Since then, in this city of kites and heights, the years count 364 days and a 25th of January. Although to be honest, for the last five years the years grow shorter every time as the 25th is followed by the 28th and the 18th and the 30th and the calendar is progressively stuffed with commemorations and funerals and elections and coups and victories and defeats. A handful of people gather in Cairo on the 24th January two thousand and fifteen, last day of the year since five years ago, celebrating the fallen for the victory of a revolution that tastes like a defeat. They carry banners and flowers for the martyrs of Tahrir. And on the way, in the middle of a street with stores and policemen and passers-by, someone kills someone. Someone, while on duty, shoots, a woman who’s mourning her dead. In the middle of the street and in the middle of a defeat a woman starts falling while her body starts dying. As her legs and her lungs and her memory start to die, someone holds her in the middle of the fall. A man embraces a fading woman so that she doesn’t die on the ground. The last day of the year a woman falls and a man holds her. It’s the twenty fifth of January in Alexandria and we’re in the street. Surrounded by people who cry and who carry the body of yesterday’s falling woman. We all fall little by little while we see our faces veiled with sadness. Rage has settled between our eyebrows ageing our faces and emptying our bellies while filling the network with mourning birds. Friends keep arriving and we hug not to talk. We hold while falling knowing that this fall is not a stumble. Knowing in silence that here you fall because they throw you and the bodies get trapped in the thorns of the flowers for the dead. We hug because we know how to cry but we don’t know what to say. A friend has been mourning a widow through every hour of the night. We walk to a café to be accompanied in this parenthesis. He asks me to say something and to smile. Because like this we will smile together along the way. He tells me that he doesn’t know how to start building the plan for the next 364 days and I tell him that we can start planning the next 60 minutes. That we should plan how to win for 60 minutes every day. A victory like a hug in the fall or like a dried kite in the sky. Text originally published in spanish in Nativa magazine.